Steve: I believe food is one of the great pleasures in life. And I believe that beer is food. I love everything about it: I love drinking it, talking about it, thinking about it. I also love the community of KV, where I grew up and where Foghorn Brewing Company is located. Esty: I have been brewing for almost 13 years. I worked at Picaroons, Petit Sault, have done a bit of Gypsy brewing, and consulted on various projects, including Mama’s Brew Pub and Beckwith Road. I love the beer/brewers culture; I find it’s a part of our society that was in dire need of being brought back. It opens up the channels of communication and friendship. Drink more pints and put down those damn phones! Steve: I hitch-hiked across Europe and the UK when I was 18. There I first discovered real cask ale and it changed everything. A few years later, I ended up on the West Coast for a number of years and was introduced to the North West craft beer renaissance. That was when the dream was born. Esty: I was fortunate enough to be part of the early trailblazing that Picaroons did. I used to help bottle and glue four-pack boxes for payments in short-fills in University. Then when I returned from teaching English in South Korea, friends told me to go see Sean Dunbar [owner of Picaroons] for a job. I started washing kegs and gluing boxes, and the love for beer and brewing grew from there. What appealed to you about setting up shop in KV? Steve: I was born and raised here. My family and friends are here. There was no question about opening a brewery anywhere else. It’s a great community, beautiful, happy, and growing. Most importantly, We feel it deserves its own craft brewery. What size/manufacturer/type of system will you be brewing on? Expected output? 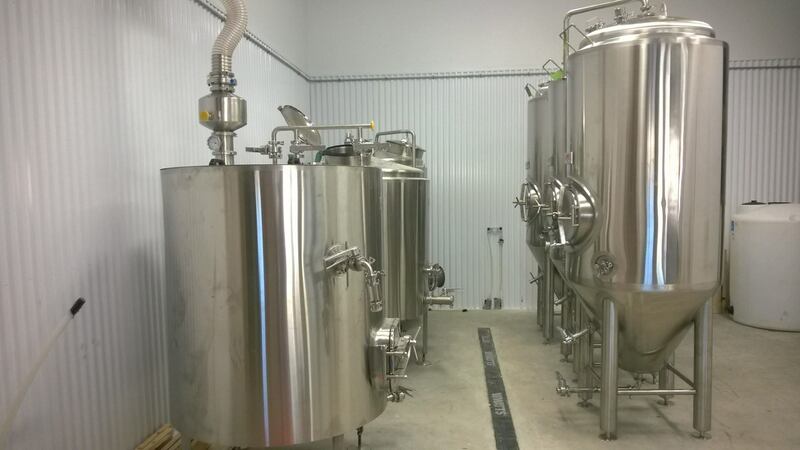 We are a 7 BBL (800 L) brewhouse (from DME in PEI) expecting somewhere in the range of 600-700 hL range yearly. Can you tell us about the beers you plan on offering initially? Are you planning on offering a specific style, or genre? Esty: We won’t be tied to any specific style; seasonals and one-offs are a must and allow for lots of fun and adventure. We also love the idea of collaboration with our fellow brewers and will hopefully have a dedicated tap in our taproom for collaborations only. The three styles we will lead with are a British Golden (my background is mainly British brewing, so this was a no-brainer), a West coast-style IPA (why deny the obvious), and an Irish Dry Stout. We will also start doing cask ales as soon as possible, likely just out of our taproom at first but eventually to accounts. What are your plans for distribution? Will you be licensed for on-site sampling/pints? As far as distribution, we are focusing on the local area. Initially, just KV and the greater Saint John area. Although we are growth-oriented, we are a small brewery and don’t want to spread ourselves too thin. Our location at 47 Clark Road in Rothesay will sell beer in-house by the glass in our taproom or in growlers for off-site consumption (even kegs, if you’re that thirsty!). We’ve had great support from the local restaurant and pub community already. We’ll be on tap in a few local establishments in the KV and SJ area. It’s important to us, however, to ensure we have plenty on hand in our brewery for when people visit us in Rothesay. Check our website once we’re open for our account listings. Regardless, we’re excited to partner with such great local businesses. Yes. Yes. A thousand times, yes. Too many to list. Other than friends and family, the Town of Rothesay, and the local business community, a number of Maritime-wide craft breweries have been more than willing to help and give advice. So many that I hesitate to list them lest I forget anyone. To everyone that helped: we are forever grateful! Thanks to Steve and Esty for answering our questions; we look forward to trying their beers in Rothesay in the very near future! Follow them on both Facebook and Twitter for updates; of course, we’ll be providing more information as it becomes available.